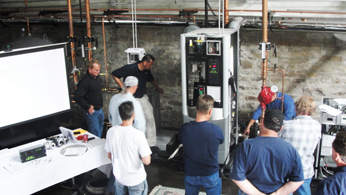 McCotter Energy Systems has created a one of a kind learning lab for engineers, contractors and end users to learn about the latest boiler technologies commercially available. 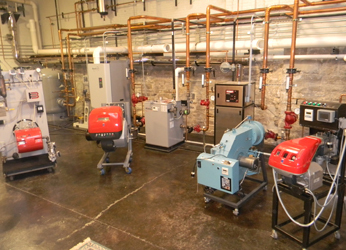 The Smart Energy Lab located at our main office in downtown Milwaukee, provides a unique opportunity to see and compare boilers of varying materials and performance (stainless steel, copper, or aluminum). Operating boilers and burners are displayed in a comfortable lab setting designed to facilitate open and honest discussion of the most efficient and reliable system for a particular application. The latest and most efficient boiler retrofit technologies are on display and operational, whether a linkageless burner retrofit system or new high efficiency gas/oil burner. The Smart Energy Lab is available to our clients and business partners for tailored boiler technician training sessions. For contractors and engineers the facility is an excellent opportunity to show your clients the latest reliable efficiency technologies that your firm is specifying and/or installing. To schedule a visit please call (800) 950-4822 or email.